BERLIN, Germany (CNN) -- John Demjanjuk, the former U.S. auto worker suspected of Nazi war crimes, has been deemed fit to stand trial, prosecutors said Friday. 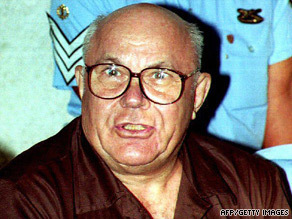 File image of John Demjanjuk during his trial in an Israeli court in 1993. Demjanjuk was deported in May from the United States to Germany, where he was wanted for his alleged involvement during World War II in killings at Sobibor, a Nazi death camp in Poland. He was charged in Munich, Germany in March with assisting in about 29,000 murders while serving as an SS guard in the camp in 1943. Demjanjuk lost a U.S. Supreme Court case against his deportation. His lawyers had asked the high court to consider their claims that he was too ill and frail to be sent overseas. They also raised human rights and other legal issues. Demjanjuk, a native Ukrainian, has long claimed he was a prisoner of war, not a death camp guard. He denies any role in the Holocaust. While Demjanjuk has now been deemed fit to stand trial, doctors have restricted the time he can be tried each day to two sessions of 90 minutes each, said Munich State Prosecutor Anton Winkler. The case dates back to the late 1970s, when the U.S. Justice Department accused Demjanjuk of being a Nazi guard known as "Ivan the Terrible." His U.S. citizenship was revoked in 1981, and he was extradited to Israel in 1986. Demjanjuk was convicted in an Israeli court in 1988 and sentenced to death, but that conviction was overturned in 1993 amid evidence that someone else was Ivan the Terrible. A federal court restored Demjanjuk's citizenship, ruling the government withheld evidence supporting his case. But his citizenship was revoked again in 2002 after a federal judge ruled he entered the United States illegally in 1952 by hiding his past as a Nazi guard.